(Book + CD) The Frog Blues & Jazz Annual No. 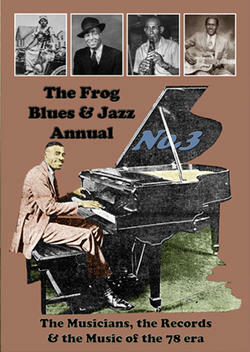 3 has 176 packed full color A4 pages of text, with over 200 photographs and illustrations, many previously unpublished. Each copy comes with a complimentary 24 track CD that includes many classic recordings as well as previously unissued rarities, test pressings, vanity & field recordings plus alternative takes by some of the greatest (and obscure) Blues & Jazz artists of the 1920s and 1930s. UPC 641654710428 The book features new original research, discographies and articles by MIchael Hortig, Paul Swinton, Bruce Bastin, Gayle Dean Wardlow, Alex Van Der Tuuk, , K.B. Rau, Helge Thuygesen, Marshall Wyatt and many others. Reprints of many 'lost' interviews and articles from the artists themselves. 'Blues & Jazz Advertised' from the era of the 78 record plus stunning original artwork by Nic Cowper, Chris Powell, Wally Fawkes and Robert Crumb. Individual artists 'covered' range from Fate Marable to Winston Holmes, George Lewis to Peetie Wheatstraw, Roberta Dudley to Thunder Smith, and Freddie Keppard to Cow Cow Davenport. They're all here, and many more, in the eagerly awaited number three edition of this exciting publication. Each copy comes with a complimentary 24 track CD that includes many classic recordings as well as previously unissued rarities, test pressings, vanity & field recordings plus alternative takes by some of the greatest (and obscure) Blues & Jazz artists of the 1920s and 1930s.